This dairy-free cream cheese frosting is almost too good to be true. It’s ultra-creamy and tastes remarkably similar to cream cheese frosting, without using nuts or tofu. The secret to this creamy frosting? Sweet potatoes. White sweet potatoes, to be exact. I used white sweet potatoes in this recipe for obvious reasons– I wanted this frosting to look like traditional cream cheese frosting! Because this recipe doesn’t call for powdered sugar, it’s not as thick or grainy as a traditional frosting. Instead, it’s silky smooth and a lot “lighter” in texture. It’s sweetened with pure maple syrup and gets it’s signature tangy flavor from a combination of freshly squeezed lemon juice and apple cider vinegar. I find that this acid combination tastes more like “cream cheese” than if you were to just use one or the other alone. I recommend that you make this frosting the night before you plan on serving it so that it can thicken in the fridge. It’s a little runny straight out of the blender, but it thickens up quite a bit more when chilled and tastes even MORE authentic when you spread it on a batch of Vegan Pumpkin Bars or Coconut Flour Carrot Cake. This recipe makes a little over 2 cups of frosting, and would nicely cover a sheet cake baked in a 9-inch by 13-inch pan. I used it over a 9-inch square pan in these photos with plenty of icing leftover. I hope you’ll enjoy it! 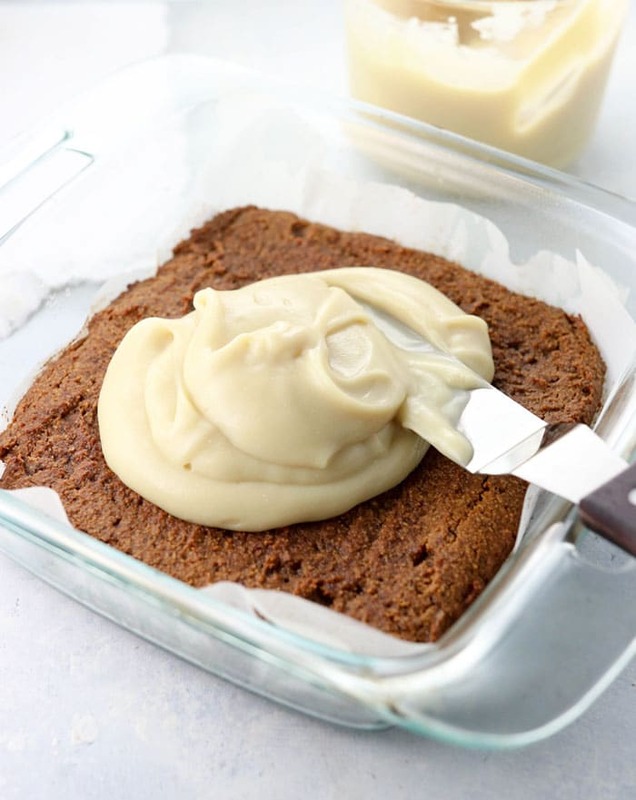 This dairy-free frosting is made with just 6 all-natural ingredients for a healthier frosting that tastes like cream cheese. 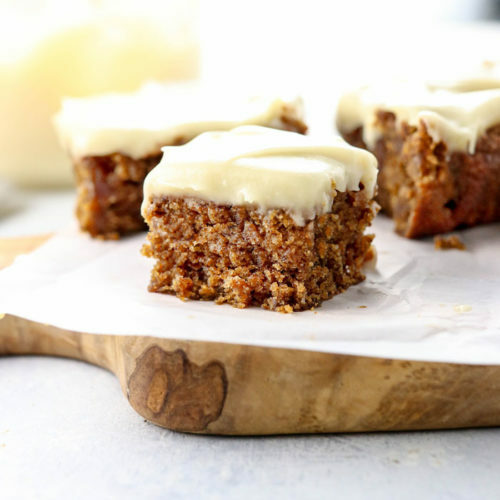 Perfect for pumpkin bars, carrot cake, and more. To prepare the sweet potato, peel and cut it into 1-inch chunks. In a pot fitted with a steamer basket, bring 1-inch of water to a boil and steam the potato chunks until fork-tender, about 10-15 minutes. Transfer the mashed sweet potato to a blender, and add in the maple syrup, coconut oil, 2 tablespoons of water, lemon juice, apple cider vinegar, and salt. Blend until silky smooth. If the mixture isn't blending well, add more water 1-2 tablespoons at a time until very smooth. Be careful not to add too much water or the frosting will be too runny. Once smooth, transfer the frosting to an airtight container to store in the fridge. 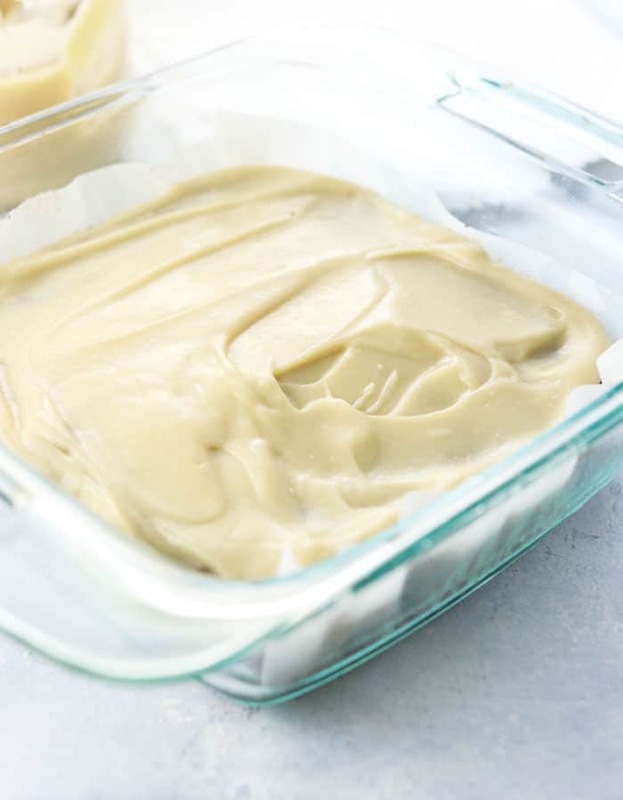 This frosting will thicken overnight and can be spread over your favorite cakes, bars, or cookies. Be sure to keep the frosting refrigerated for best texture, though it can sit out at room temperature for several hours for serving. It should last up to a week when stored in the fridge. If you don’t care for coconut oil, you can reduce the amount used to 4 tablespoons and increase the water by 2 tablespoons for a slightly thinner/runnier frosting. I use unrefined coconut oil, which does leave a hint of coconut flavor, but you can use refined coconut oil for less coconut flavor. (I’m sure vegan butter would work here, too, but I haven’t tested that myself.) If replacing the coconut oil, you must use another fat that is solid at room temperature so that the frosting will thicken up. Feel free to use another liquid sweetener in this recipe. Keep in mind that honey is not vegan, and is sweeter than maple syrup, so you might need to use slightly less than this recipe calls for. If you’d like a more tangy frosting flavor, feel free to add more lemon juice or vinegar, just 1/2 teaspoon at a time until the flavor is to your liking. As always, if you make any modifications to this recipe please leave a comment below letting us know what you tried so we can all benefit from your experience. Reader Feedback: What’s your favorite type of frosting? I’ve always been partial to white or chocolate buttercream, and I have more dairy-free & nut-free options in my cookbooks! I’ve never heard of white sweet potatoes….now I must hunt them down and try this recipe. Tofu doesn’t like me so I appreciate recipes like this. Thank you! Super excited about this recipe! I have nut, soy, and dairy allergies and very much miss treats like this. Do you think I could sub rice wine vinegar for the apple cider vinegar? I’m allergic to apples as well, unfortunately. Quick question, is it measured out solid 6 TBSP conout oil then melted down? I was always told to measure it that way in a recipe. Is that how it is for this recipe or just 6 tbsp measured out in melted form? I measure out in melted form, but in this case I doubt it would make a huge difference. Hope you enjoy it! This recipe is yummy! I used orange sweet potatoes for a harvest themed cake. I would give it five stars, but it didn’t really taste like a cream cheese frosting at all, it’s more of a maple sugar frosting, which is still scrumptious! Would make this again. Oh my! That’s brilliant! I knew about the chocolate sweet potato, but this is awesome! I’ve been looking for a nut and soy free recipe!! Hi I was looking forward to trying this recipe which I just made! However, my question is that the vegan cream cheese frosting is more really white at all.more yellowish like golden. What would that be from? I did use a Hannah sweet potato too. It’s in the fridge now, so not sure if it will change overnight at all. Appreciate your feedback. I’ve never gotten a naturally-sweetened frosting to be very white– it’s always going to have a shade of tan/yellow to it because of the sweet potatoes and maple syrup. I do think it looks more “white” when you frost it over something dark, like the pumpkin bars in my photos. did it with a normal sweet potato as it seem that my neighborhood don’t have white one (as I’m in Montreal ) but it is quite perfect, the texture and taste really good, you made my day!!! AMAZING!!! My Publix doesn’t carry white sweet potatoes so I just used a regular one. So freaking good- seriously like the real thing. I used coconut nectar in place of the maple syrup and 3 tbsp vegan butter for half the oil but may try aquafaba next time to try to reduce overall fat content. 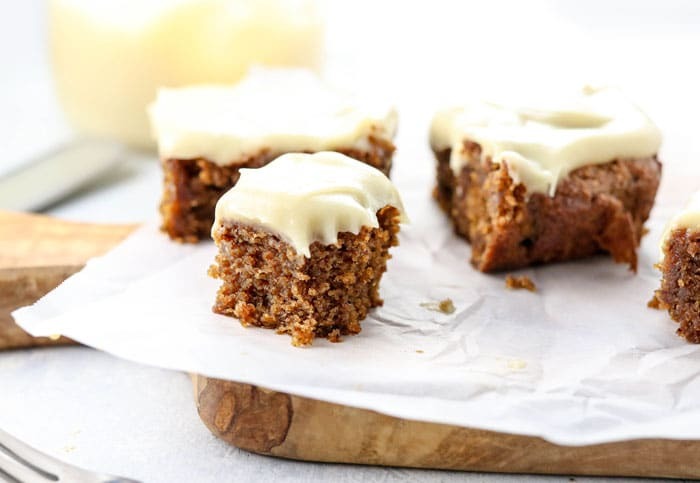 Put on a low fat gluten free vegan carrot cake and ohmygosh so delish! Thank you!!! I did cut the maple syrup with some liquid stevia as well as some vanilla, and I think next time I might add a bit more lemon, but this was so good! And people were so surprised when I told them it was made from sweet potatoes! Super excited to be able to make healthy cakes and cupcakes for my friends and family. I’d imagine you could tweak the flavors a bit to make chocolate or maybe even peanut butter. YUM! Question for you. I’m trying to make a cake for a friend who uses diet to control her MS. She is vegan, but she also obtains from coconut. The only fat she uses is olive oil and I can’t imagine that would taste good. Suggestion for replacing the fat? Or has anyone left it out completely? Thanks. This was fantastic, I can’t get over how it tastes like cream cheese! Yes, I think it’s starchy enough that it would freeze and thaw okay. Glad you enjoyed it! I’m very curious to try this. BTW, sweet potatoes (white or yellow centers) are native to the Americas and yams (orange centers and what we often call sweet potatoes) are native to Africa. Many grocery stores carry both, but it takes a close look to determine which is which. Yams aren’t grown in the US. You’ll see Yam or Sweet Potato labels in grocery stores in the US. No matter what the color is though, they are all sweet potatoes. Yams are a different plant. I just made this and am planning on trying to use it in a pumpkin roll in the morning after it sets up.The flavor is really good, however the texture seems a bit grainy/starchy. I’ve used a ninja blender, but after 5 or more minutes it hasn’t gotten super smooth. Will that change? Thinking maybe it won’t be noticeable once I spread it in the roll, but was making sure I didn’t do anything wrong. Also it is quite a bit darker than yours-maybe my maple syrup brand was different? I use pure Maine dark maple syrup. Thanks for your feedback. I was so excited to find this recipe! No cashews, powdered sugar, or store bought junky vegan cheese! Woo hoo! I was a bit nervous about the final result but I just made it and it’s soooo goooood!!! I did use honey and I think about 5-6 tablespoons is perfect, I also added 2 teaspoons vanilla and a half teaspoon almond extract, I upped the salt to 1/4 teaspoon and used coconut milk in place of the water…it amazing! THANK YOU! How do you think this would work in a pumpkin roll? 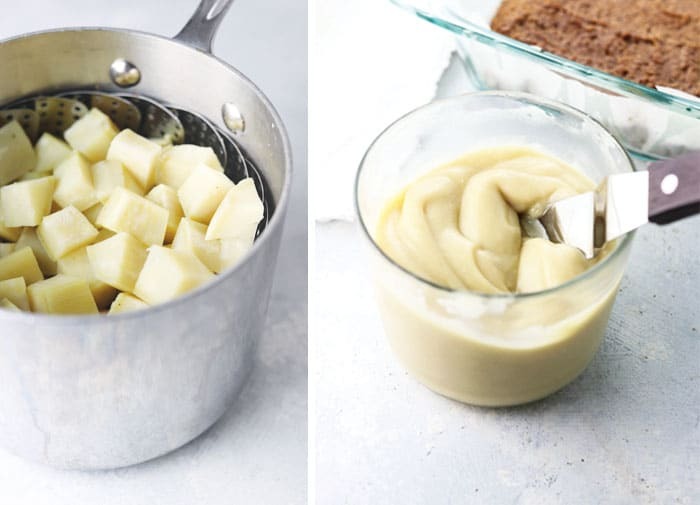 I have a GF, vegan recipe for thanksgiving that I’d love to try this as a repacement for the regular cream cheese frosting. Last year I tried a pudding, but it wasn’t so good. Do you think it would withstand being rolled up in a pumpkin roll and frozen like I do for the other? Hi Megan! I have been trying to find recipes having in mind the good way to combine foods and it has been a long journey. I am SO glad you have this blog that helps me to make healthier meals for my family. You are one of the few nutritionist that apply this concept that I consider the secret for a healthy digestion! I have a question regarding to the rest of recipes in your blog: are all of them fallowing this principle? Thank you so much for what you do!!! Hi Glenda! All of the recipes in my cookbooks are properly combined and are clearly labeled to make food combining easy (there are properly combined meal plans and entertaining menus in the books, too), but that’s not always the case for free the recipes on my blog. I’m trying to go back and label the 500+ recipes on my site, but it’s going to take a while! You can see on my more recent recipes where I try to label them as a STARCH, PROTEIN, or SPECIAL TREAT (which means the recipe is not necessarily properly combined). because all potatoes are different sizes, how many GRAMS was your potato prior to peeling? My sweet potato was 371 grams, unpeeled. I made a couple of TBLS more than called for, but it wasn’t a problem. I also used just 2 TBLS of maple syrup and found it to be sweet enough. Any tips on where to find white sweet potatoes in KC?! Whole Foods! I’ve been to two locations and both almost always have them around where they sell other sweet potatoes. Genius!!! I was highly skeptical, but with the exception of your gingerbread cookies which were amazing right out of the oven but no so good after that, everything I have made from your website and cookbook has been fantastic. OMG so good. I used a table spoon of vanilla extract so I didn’t need any more than 2 tbsp water and then 1/4 tsp vanilla bean powder to make it vanilla and it’s fantastic. Do not be skeptical to make this anyone you will not be let down!!!! What can I substitue for the lemon juice, since I’mm allergic to citrus? the “juice” from sauerkraut, apple cider vinegar or any vinegar. Pineapple might do the trick– sweet and tangy. So excited to try this. Mine’s going to be orange as that was the only color sweet potato I had on hand! I have a son with food allergies – it will be so fun for him to get frosting on his cupcake!! Why isn’t honey vegan? I can’t think of anything in it that is animal product. Some bee keepers do very cruel things to their bees. Harvesting the honey sometimes destroys their combs and it is common practice that if the queen is less fertile than she used to be they will purposefully injure her so the bees will prepare a new queen. In this way they can have two queens producing new bees at once in the hive. But it’s kind of mean! If you want to consume honey you can always get it local and visit the bee keeper and ask them if they humanely keep their bees. However, some people would argue that there is no humane way to steal all the food they have been working so hard to produce! So that’s the rub. A beekeeper’s role is to provide as optimal a home as possible for her bees—protecting them from predators, medicating them against illness and pests, and giving them a place to build honeycomb as quickly and easily as possible. When bees are kept in a better situation than would naturally occur in the wild, they’re able to devote more resources to producing honey, and will produce more honey than they need to survive the winter. That is what the keeper takes. There’s no reason for a keeper to harm or kill the bees she’s tending, to destroy their comb, or to take all of their honey. It would be completely counterproductive. By eating fruits and vegetables, you are already enjoying the labor of bees (commercial pollinating bees, who are treated much less kindly than bees that are kept to produce honey). If the criteria for being a vegan is as strict as all that, you’ll have to give up quite a few nuts and fruits and vegetables as well..
PS: No hive would have two queens. That’s complete misinformation. Vegan cream cheese frosting made with REAL ingredients?! You are amazing!! Megan, your recipe creations continue to amaze and inspire me. You have proven time and time again that a diet of whole foods does not mean deprivation. We literally can have our cake and eat it too, with frosting none the less!! White sweet potatoes are very hard to come by where I live. Do you think I could use a regular white potato and simply add more sweetener? Awesome and good to know.